Do you think your kitchen looks drab and lifeless? Or is it too small that things cluttered the counter or the cabinet? If you don’t have the budget to do a renovation, you can at least do some kitchen decorating. It does not have to be expensive if you do it the smart way. Set a cost limit and make sure that you stay within the budget by recycling stuff and buying items that are on sale. To help you with your project, here are 5 kitchen decorating ideas for the designer on a budget. Pull the laminate off the countertop with the use of a hammer and pry bar. (Hammer the pry bar from the edge of the laminate top and yank it off.) Then sand the wood (counter) top, removing pieces of wood sticking up and loose splinters with a palm sander. 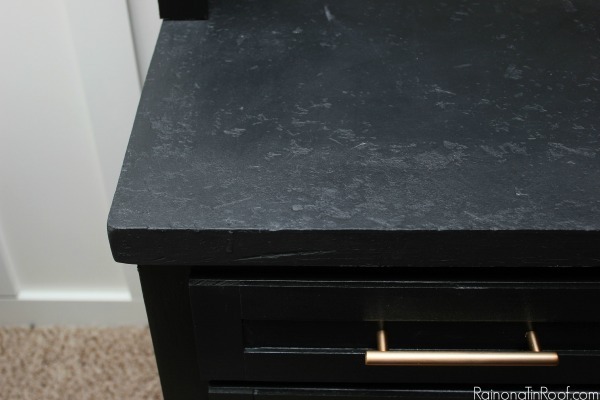 To get the perfect “stone” look, use Rust-Oleum Chalkboard paint. Apply the paint directly to the wood in three coats allowing the paint to dry after each coat. Seal paint with Minwax Finishing Paste Wax to protect the paint from fading. You will also need an AutoRight Detailing Polisher to apply the wax. Place a tiny amount of wax on the foam applicator then apply it to the counter, covering all the painted area in the process. Allow the wax to set for at least 20 minutes then using the microfiber bonnet, buff the entire top. If you’ll be using the countertop a lot, use a heavier sealant like polycrylic or polyurethane that will withstand water a lot better. The finished product should look like this. 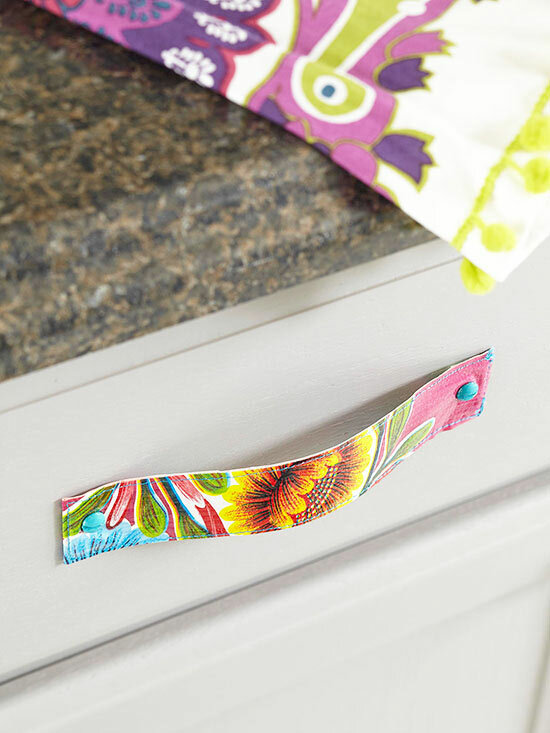 Personalize you cabinet doors by creating your own pulls using printed oilcloth handles. With a pair of scissors, cut a narrow strip of oilcloth measuring approximately 1-1/4×14 inches in your chosen design. Fold the cloth in half and stitch the two long sides to make a pocket. Insert three layers of cut heavy cardstock inside the pocket to gain enough support then stitch both ends of the pocket closed. Paint two screws in colors that coordinate with the pulls and let them dry. Attach the pulls to your cabinet using the painted screws. Now you have pretty personalized cabinet doors. To reduce clutter in your cabinets and counters, make your own wall-mounted, magnetic spice rack. Creating a magnetic spice rack will help you save a lot as pre-made ones are quite expensive and may not be designed for the space you have in mind. To learn how to make one like what is pictured below, click here for the step-by-step instructions. If you want to add a rustic touch to your kitchen this kitchen decorating idea is just what you need. 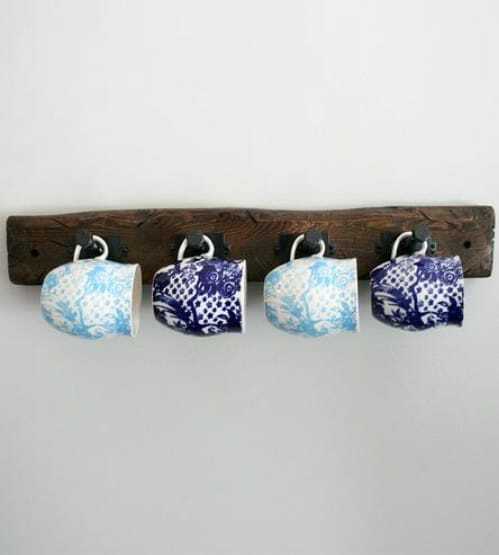 It’s easy to do and you only need a piece of wood, the older the better, and a few hooks to hang the cups. First cut the wood according to the length and width that you want. Pierce the hooks into the widest part of the wood and put proper distance between them to ensure that your cups or mugs will not bump each other. Stain the wood with a natural tint and hang it on a wall in your kitchen. You can also make one for your tongs, ladles, and other kitchen utensils.